Sometimes we need to read the strongly typed view control values using jQuery in ASP.NET MVC. As we know Strongly typed view is created from model class . So let's learn step by step how to achieve this task. Consider we have following Strongly typed view which is generated from preceding model class. If you run above code then by default id and name of the control is the name of model property which is we defined in model class, That is if we defined the property name as city then by default id and name of that control is city. However we can define the id and name of the control as we wish . 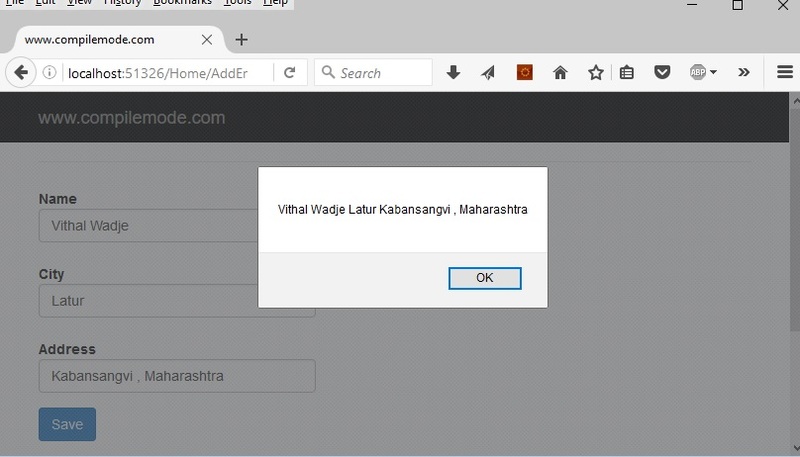 In preceding generated html we can see that id and name of the controls which are enough to identify the controls and read the values with their Id or Name. Now create the following function to read the controls value . Now if you click on save button then it will shows the textbox values on alert box as shown in the following screen shot. I hope from preceding example , We have learned how to read strongly typed control values using jQuery in ASP.NET MVC. To use above jQuery library you need an active internet connection , You can download and use it as offline . Now You need to be add reference of downloaded jQuery library reference as like below.